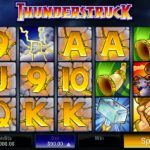 In front of us we have a very powerful slot, Thunderstruck from Microgaming. This game is based on Thor, the Nordic God of bad weather. But, his destructive power is working in your favor and it will bring luck to you. The legend of Thor includes storms, lighting and thunders so they are all incorporated in the form of symbols. On top of that you will see Thor himself and he will bring some good wins back to your bankroll. Thunderstruck is packed with special symbols and features. We have Thor himself as a wild and every time he completes a win his hair blows in the wind. His function in this game is to substitute for every other symbol except for the scatter and it also doubles your wins. The main feature of the game is the free spins round. You need to land 3 scatter symbols at least to receive 15 free spins. All the wins during the feature are a subject to a x 3 multiplier. We are a bit disappointed a bit here since there are no mini bonus rounds, but still the free spins are easily activated so we cannot say that the game has not got any perks at all. 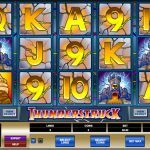 Thunderstruck is a great game from Microgaming. This slot turned out to be an instant success after it was launched so it also has a sequel. The game kept our attention and we will come back for sure. This is an entertaining slot with lots to offer. Betting options are a bit limited though and high rollers would probably look for a game that offers higher bets. But at this point 45 coins are high enough for us. Another fun slots game you should consider playing is Lost Princess Anastasia a 5 reel slot by MicroGaming.